Toshiba's Qosmio G40 is a mighty machine with a mighty price. 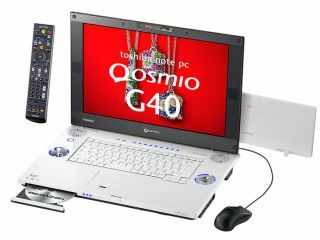 In what has been trumpeted by the firm as a stunning 'world's first' Toshiba Japan has upgraded its Qosmio G40 laptop a notch or two to make it the first on the market to include an HD DVD-RW drive. Owners of the ¥400,000 (£1,750) beast will now be able to write and re-write HD DVD disks to their hearts' content for viewing either on the machine's 17-inch 1920 x 1200-pixel screen or on an HD TV via the HDMI connection. Other small changes to the laptop we first saw in May include a second terrestrial digital TV tuner and a 400GB hard drive. The 4.8kg bulk is still the same, making it clear that we're really looking at a desktop replacement here. Since it was ratified in September by the DVD forum, the ability to record using the new HD Rec compression has been included, meaning high-definition broadcasts can be laid down on standard DVDs. Although the older disks are much cheaper than recordable HD DVDs, each can hold only 24 minutes of HD TV.